I don’t know about you but for me; I have become overwhelmed in trying keep track of my computer passwords. If you have as many accounts as I do, then you already know that saving your passwords is a must. There are so many risks regarding security breeches and it can be very scary. Most websites require the password to be 8 characters long and have special symbols included. It’s not safe to use the same password on all of your accounts. How can you possibly remember them all without writing them down? Now I know that writing passwords down is seriously frowned upon. Unless you have a system where you use codes for your passwords that will help you remember them. Side Note: Needs to be said – Never write down you bank account passwords. 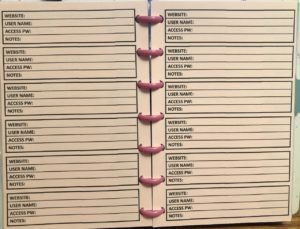 A couple years ago I put together Top Secret and gave away a freebie editable password tracker. As most of you know, I am a Happy Planner girl all the way. 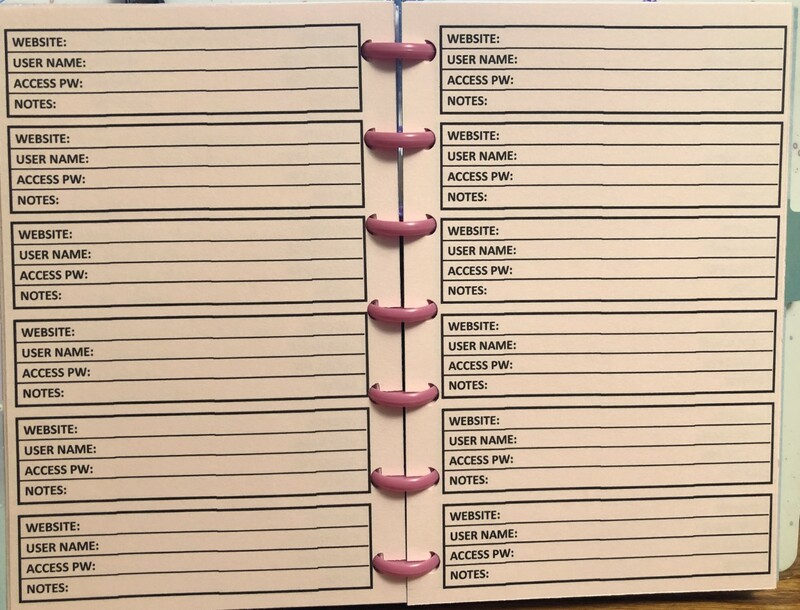 I had to have my Happy Planner sizes for a password tracker and offer the generic blank versions as a freebie for you to try out. These can be printed on color paper to stand out in your planners. Sample below of my MHP printed on pink paper to stand out. You can purchase an editable version at My Life Planners Etsy Shop. So if you do not like your handwriting, there are editable versions.